I had a conversation last year that left me a little shocked and not a little frustrated. "I believe in the separation of the body and spirit at death." "But what about the resurrection of the body?" "Is it the resurrection of the body?" "That's what the creed says." "... but what is 'the body'?" At this point I, the second voice, was caught in something of a stunned silence. I was listening to a well-educated, intelligent, confessing Christian deny the bodily resurrection of the dead. I don't remember now what exactly I said next--only being dissatisfied with it and thinking of a hundred better responses later that day. Of course, for all my talk about being 'shocked' or 'stunned' I realize that I might have had the same conversation with a hundred thousand different people across the US. There is some serious confusion here; which is why I'm blogging on it. This post won't reach a hundred thousand people, but it might reach a handful, and that's better than none. So let's talk about the resurrection of the body. "I believe in... the resurrection of the body"
This is a clause in one of the ancient creeds of the Church, the Apostles' Creed. This classical statement of faith concludes: "I believe in the Holy Spirit, the holy catholic Church, the communion of saints, the forgiveness of sins, the resurrection of the body, and the life everlasting. Amen." Christians have been confessing a future, bodily resurrection since the earliest centuries of the Church. We see this not only in the creeds, but also in the early Church Fathers. As early as Polycarp (c. 69-c. 155) and Justin Martyr (c. 100-165 ), one who denied the resurrection of the body--even if they affirmed the immortality of a disembodied soul--was considered to be no Christian at all. Saint Augustine later claimed that "all Christian doctrine perishes" if we take away faith in the resurrection of the dead. These are strong claims. Where did the Fathers get such confidence? And what do we make of it? Clearly people have believed in a bodily resurrection for a long time, but is this a biblical idea? The most powerful discussion of the resurrection in the Bible, I find, is in 1 Corinthians 15. Here Paul discusses, among other things, the centrality of Jesus' own resurrection to the gospel and the implications of Christ's resurrection for the eternal hope of believers. This long, detailed, and adamant discourse came after the apostle discovered that some in the church in Corinth had dispensed with a belief in the resurrection of the dead, the raising of corpses (15:12). Paul, anticipating Augustine's confession centuries later, reasoned that if the dead are not raised, inevitably "our preaching is in vain and your faith is in vain" (14). Jesus is "the firstfruits of those who have fallen asleep" (20). The "firstfruits" are but the beginning of the season; just as Christ was raised, so the full resurrection harvest is yet to come. 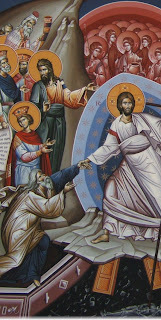 The death Adam brought into the world reaches out and touches all, and likewise the resurrection that came with Christ will come to all at His return (21-23). Easter was the beginning of the final resurrection of the dead. In the resurrection of the dead, we will "bear the image of the man of heaven," Jesus (49). This is "a resurrection like His," as Paul writes elsewhere (Rom 6:5; see also Phil 3:20-21). This is, finally, Paul's answer to the question "How are the dead raised? With what kind of body do they come?" (1 Cor 15:35ff). If you want to know, look at the body of Jesus. Our expectation of resurrection and our very understanding of resurrection are rooted in the risen Lord Jesus. Here, then, is the answer to my friend's question: "but what is 'the body'?" 'The body' is the thing that came out of the grave on Easter morning. This thing could enter a room through locked doors, but it could also be touched, and could ingest broiled fish. This is no disembodied spirit. The portrait of the future resurrection is a real body--different, made new and changed, but very real. The early Christians proclaimed that God had broken the power of death by raising Jesus bodily from the grave; therefore, the New Testament writers and the early Christian creeds looked forward to the resurrection of the body as the consummation of God's redemptive action in the world. Belief in the bodily resurrection flows naturally out of our confession of the victory of God in the resurrection of Jesus. The gospel, then, is not about "this soul, stranded in some skin and bones" (sorry, Bono). That's the ancient pagan philosophers talking--an attitude that has quietly crept into the Church's popular theology. Paul's gospel was mocked by many of his hearers in Athens precisely because of his belief in the resurrection of the dead (Acts 17:32). The 2nd century Greek thinker Celsus ridiculed this hope, calling it "the hope of worms"--and he sure didn't say that because Christians believed in the eternal bliss of a disembodied spirit. Any notion today of a soul going off to heaven at death is the descendent of this ancient pagan thought, not the Christian teaching. The Church has always witnessed to God's healing, not discarding, of the body. I realize that this will all sound pretty scandalous to a lot of people. We're so used to the comforting talk of escaping the sufferings and difficulties of our bodies. It's a message that you hear at many Christian funerals, from the pulpit and in the private consolations offered to the bereaved. The idea is that we can take hope--we who are left behind, or we who look forward to freedom from our own pain--in the knowledge that the troubles of life on earth will pass away for eternity. We just have to hang on. There's a grain of truth in this, but it's taken the wrong way. Yes, there is freedom ahead, and a time when "God will wipe away every tear from their eyes, and death shall be no more, neither shall there be mourning nor crying nor pain anymore" (Rev 21:4). These old things will pass away. But this does not come with the abandoning of the body. We do not, in death, throw off the flesh like a husk that has served its purpose. The body is not abandoned but transformed. God is going to make all things new. That's the heart of the gospel and the hope of believers. Suffering, all enmity, and the poisoning of our bodies that came in Eden will be extinguished--all of Creation will be put right. "'Death is swallowed up in victory.' 'O death, where is your victory? O death, where is your sting?' The sting of death is sin, and the power of sin is the law. But thanks be to God, who gives us the victory through our Lord Jesus Christ" (1 Cor 15:54-56). That is the hope of the resurrection of the body. As long as we feed each other a different message of another 'hope', we are missing out on the power of the truth of the gospel to heal and minister to the people of God. Much of this post is indebted to the work of Richard B. Hays, "The Resurrection of the Body: Carnis resurrectionem" in Exploring and Proclaiming the Apostles' Creed and Brian E. Daley, "A Hope of Worms: Early Christian Hope" in Resurrection: Theological and Scientific Assessments. As my last post indicated, lately I’ve been reading C. S. Lewis’s Reflections on the Psalms, as I prepare to teach a Bible study on the Psalms for Spring Hill United Methodist Church this summer. It’s been some time (almost two years!) since I’ve been able to really read Lewis, and I’ve really enjoyed this visit with an old friend. He’s as interesting as ever. In chapter 10 of the Reflections on the Psalms, Lewis is musing on the Church’s traditional claims that the Old Testament is often speaking of the New—that the ancient Israelite authors frequently speak about the events of Christ’s life or the doctrines of the Christian faith, though they probably do not know it. For instance, when St. Augustine read Psalm 18:9—“He bowed the heavens and came down”—he thought only of Jesus: the one who would “descend to men’s infirmity.” As Lewis puts it, “the full significance of what the writers are saying is, on this view, apparent only in the light of events which happened after they were dead.” This is one way the Church worked out the meaning of Jesus’ teaching in Luke 24:27 that “all the Scriptures” can be interpreted with reference to himself. Lewis sees this move as distinct from, on the one hand, claiming prophetic inspiration or, on the other hand, dismissing apparent similarities between an earlier word and a later reality as coincidence. Essentially, he’s looking for an agreeable rationale for the identification of, say, the Suffering Servant in Isaiah with Jesus Christ. The route he follows towards this rationale is, I think, brilliant and provocative—though I’m not ready to endorse what follows. Two examples are crucial in his discussion. The first is a fiction. Suppose a biologist teaching on adaptation describes a hypothetical animal that has evolved in a particular, hypothetical environment. Some time later, such an animal is in fact discovered, and it is, of course, in just the sort of environment the biologist had described. “This resemblance,” Lewis claims, “is not in the least accidental. Insight and knowledge, not luck, led to his invention. The real nature of life explains both why there is such a creature in the universe and also why there was such a creature in his lectures.” The man’s intimate knowledge of the operations of the world refined and directed his imagination as he made an example for his students—refining and directing it towards truth. The second example comes from the writings of Plato (c. 429- c.347 BC). In the Republic, the Greek philosopher suggests the righteousness may only be understood in its true nature if one imagines “a perfectly righteous man treated by all around him as a monster of wickedness. We must picture him, still perfect, while he is bound, scourged, and finally impaled (the Persian equivalent of crucifixion).” Is it a coincidence, Lewis asks, that Plato’s picture of righteousness evokes so clearly the death of Jesus some four hundred years later? Because Christianity is true, the logic goes, Plato’s true insights centuries before Christ become entangled with that truth, and so can indeed be said to speak to the reality of Jesus. The Passion of Christ is a genuine second meaning of this passage in the Republic. It is not the meaning Plato had in mind, but it is "congenial with it." Lewis is not trying to prove anything here. He doesn’t present this discussion as evidence that the psalmists of ancient Israel (or anyone else) did in fact somehow write of Jesus of Nazareth centuries before his birth. He simply offers this as an explanation for why reading the Old Testament in this way may not be such a bad thing. Truth, which is perfectly revealed in Jesus Christ, will always look a certain way, no matter who says it or when it is said. Every now and then, the finest minds may just glimpse it, even if the revelation itself is still to come. What do you think of this? Does this make Christian readings of the Old Testament any easier to swallow—if they were at all distasteful to begin with? What about Lewis’s assumptions about the nature of truth and revelation? As I said, I think it’s a really brilliant discussion. Still, I’m quite sure where I stand on the question as a whole.